Dustin and I decided to go up into Garnet Canyon today and check out the Chouinard and Ellingwood Couloirs. It has been almost a month since I’ve been up in Garnet, so it is going to be nice to check out the conditions. The morning started out nice and cold…probably about -20°F, and we waited for the sun to rise to get out of the car. With all the vapor in the air, we were treated to a nice sundog just after sunrise. The cold felt good and we quickly skinned up into the canyon, following what looked like another party of two. We entered the ‘ice box’ of The Meadows and continued up into the South Fork of Garnet. 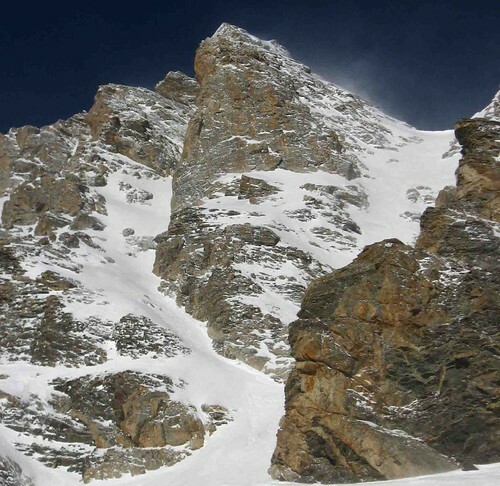 It looked like the other guys when towards the JHMG camp…maybe over to Dike Couloir. Everything was going well until we climbed up into the canyon where a ground blizzard began to pelt us with blowing snow. My guess was that it was a pretty steady 30 mph for a bit. I tried to stay positive, charging up to the staging area next to the cliffs at the base of the two couloirs. I snapped a few pics and hiked out to check out the lines. They looked…ok…obviously wind hammered though. If it wasn’t so windy, we probably would have gone for it. But the wind made it unpleasant and I have nothing to prove right now. I have skied both of these lines many times, solo as well. 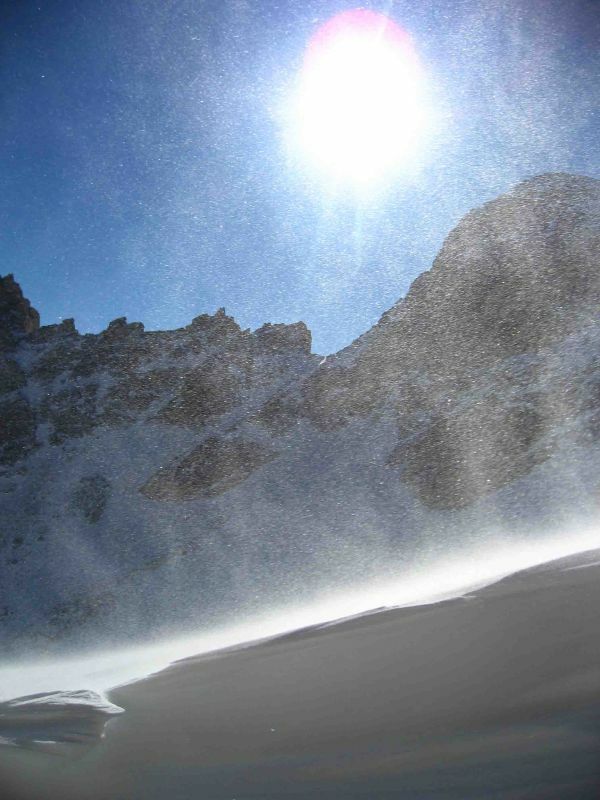 We skied over to the Cave Couloir and the skiing wasn’t half bad. Very firm and wind buffed, but not very icy and quite skiable. When we got down to the Meadows we noticed that it looked like there wasn’t a breath of wind on the Grand Teton…or anywhere else in the canyon but the South Fork. Weird? Well I have one more day off, so hopefully I can get on a peak or something tomorrow. Maybe a solo adventure…and a little less wind would be nice, cuz my face kind of burns right now.